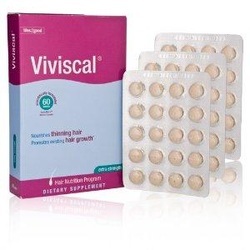 Viviscal Women’s Maximum Strength Tablets is ideal from women suffering from hair loss and looking for a quick and effective solution to tackle this distressing problem; these special tablets are formulated especially to help promote existing hair growth to reduce the speed of thinning hair and hair loss. 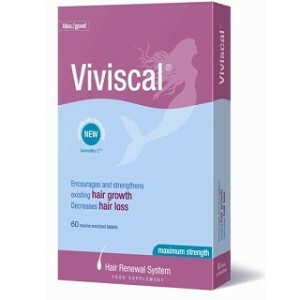 Viviscal Extra Strength dietary supplements are scientifically formulated with the exclusive marine complex AminoMar which helps to nourish thinning hair and promote existing hair growth* from within. These nutrients help nourish your hair during the Anagen phase of the hair growth cycle. Only Viviscal dietary supplements contain the proprietary marine complex AminoMar (450 mg per serving), along with Zinc, Vitamin C and Horsetail extract. * These statements have not been evaluated by the Food and Drug Administration. This product is not intended to diagnose, treat, cure or prevent any disease. Cruelty-Free, 100% Drug-Free. With Viviscal you can enjoy the feeling of better hair. Backed by over 20 years of scientific research, scientifically formulated, Viviscal Women Maximum Strength supplements contain the exclusive, proprietary AminoMar C™- a rich compound of marine extracts, blended with other naturally derived ingredients. Plus zinc and biotin to specifically contribute to the maintenance of healthy hair, by nourishing from within. Viviscal Sold in Stores and online on many sites. It may take a few months to see any benefits from using Viviscal hair loss treatment.